DES MOINES, Iowa (AP) — Strong thunderstorms rolled across Iowa, Tuesday, bringing strong winds, hail and heavy rain. The National Weather Service says wind gusts of 60 mph were reported Tuesday afternoon near Jamaica in Guthrie County, where a grain bin and a shed were damaged. 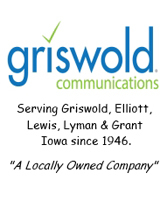 In central Iowa, power lines are down in Woodward. In Grimes, trees were snapped and a front porch was damaged. Forecasters say a strong and slow-moving system is affecting the Midwest, and will continue to do so until tonight (Wednesday). A Wind Advisory will be in effect from 4-p.m. today through 4-a.m. Thursday, for Cass, Adair, Adams, Guthrie, Dallas, Madison, Taylor, Ringgold & Union Counties. Winds of 15-to 30 miles per hour, with gusts up to 45 can be expected in the Advisory area. In addition, a Flood Advisory is in effect for the Missouri River affecting Douglas and Sarpy Counties in Nebraska, and Pottawattamie County, in Iowa until Monday morning….and, a Flood Warning is in effect for the Missouri River in Mills and Fremont Counties through at least Saturday morning.